A sleek silver ring with diamond set shoulders, finished with a cubic zirconia centrepiece, and presented in a smooth, swirl setting. This is a beautifully contemporary ring that is designed to stand out. 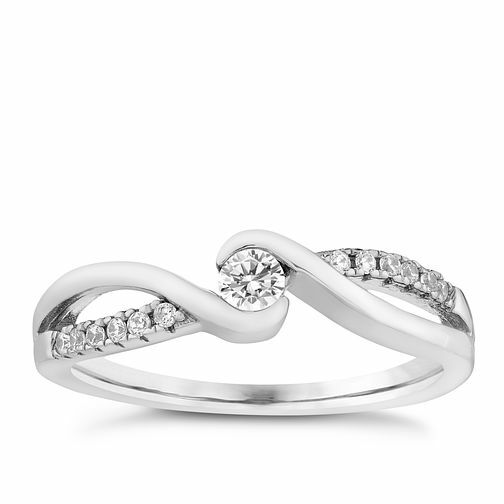 Silver and cubic zirconia twist ring is rated 4.8 out of 5 by 4. Rated 5 out of 5 by Anonymous from Excellent - a diamond option for the exact same ring would be better Of course the price is fantastic - and my partner adores the ring. A diamond instead of CZ wouls be better because this ring appears to lack 'shine'..but that's just me. She loves it. She said yes. What isn't to like?